After flood­ing washed out the road­way in 2010, an appropriately-sized cul­vert was installed under Brad­kin Road in Olive. In Octo­ber 2010 a flood washed out a stream cross­ing along Brad­kin Road in the Town of Olive. This stream cross­ing was the only way for res­i­dents to access their prop­erty. The Ashokan Water­shed Stream Man­age­ment Pro­gram granted $107,480 to the Town of Olive to replace the cross­ing with a new cul­vert that is sized appro­pri­ately for the stream chan­nel. 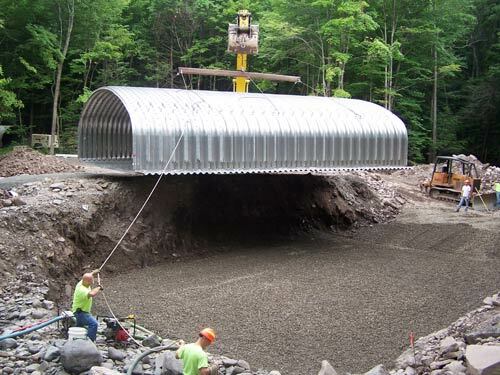 Using engi­neered designs from Ulster County Soil & Water Con­ser­va­tion Dis­trict and the USDA Nat­ural Resources Con­ser­va­tion Ser­vice, the Town High­way Depart­ment installed the cul­vert in the sum­mer of 2011. The cul­vert sur­vived Trop­i­cal Storms Irene and Lee later that year.